Amelia Earhart was born in Atchison, Kansas, on July 24, 1898. Amelia had a sister who was two years her junior. The siblings’ upbringing was somewhat unconventional because their mother did not believe in molding her children into “nice little girls.” As a child, Amelia was a tomboy. She spent long hours outdoors where she liked to climb trees, hunt rats with a rifle, and "belly-slam" her sled downhill. The girls kept a growing collection of specimens – including worms, moths, katydids and a tree toad – which they gathered on their outings. Amelia and her sister were homeschooled together by their mother and a governess. Amelia later recalled that she was "exceedingly fond of reading" and spent countless hours in the large family library. In 1909, the Earhart children were enrolled in public school for the first time with Amelia entering seventh grade at age 12. (Hamill, Pete. “Leather and Pearls: The Cult of Amelia Earhart.” MS Magazine, September 1976.) The Earhart family moved several times, and Amelia graduated in 1916 from Hyde Park High School in Illinois. Amelia began junior college but did not complete her program. During Christmas vacation in 1917 she traveled to Toronto, Canada. World War I had been raging, and Amelia was impacted by the sight of returning wounded soldiers. She trained as a nurse's aide with the Red Cross, and began work with the Volunteer Aid Detachment at a military hospital. Amelia survived the Spanish Flu epidemic but was hospitalized herself and required nearly a year of convalescence. She passed the time reading poetry, learning to play the banjo, and studying mechanics. On December 28, 1920, Amelia visited an airfield where she was given a 10-minute ride in an airplane for $10. From then on, she knew that she wanted to become a professional pilot. Amelia began taking flying lessons and she studied weather, navigation, how an airplane works, and all the other things a pilot must know. At that time, aviation was one of the toughest new professions. As a young girl, Amelia had kept a scrapbook of newspaper clippings about women who were successful in predominantly male-oriented fields. Amelia believed that women should be given the same chances as men, and that women should earn their right to work by doing their jobs as well as or even better than men. She was a member of the National Woman's Party, and an early supporter of the Equal Rights Amendment. In 1928 Amelia met George Putnam, publisher of American aviator Charles Lindbergh’s autobiography. Putnam was seeking a suitable candidate for the first-ever flight by a woman across the Atlantic Ocean, to be sponsored by a wealthy American living in London. Amelia Earhart was then unknown but would soon become a celebrity, known around the world as one of the greatest women pilots. Amelia and Putnam shared many common interests and were married in 1931. Amelia pointedly kept her own name rather than being referred to as Mrs. Putnam. Putnam was not only her husband but also her promoter and publisher. Amelia served as aviation editor for Cosmopolitan magazine from 1928 to 1930. She wrote magazine articles, newspaper columns, essays, and two books based upon her flying experiences: 20 Hrs., 40 Min. (1928) and The Fun of It (1932). In May 1932 Amelia became the first woman to fly alone across the Atlantic Ocean. She took off from Harbour Grace, Newfoundland and landed in Londonderry, Northern Ireland. This was an impressive event in the history of aviation, and Amelia was awarded the Distinguished Flying Cross for her achievement. In 1933 Amelia was the first woman to fly coast-to-coast nonstop across the U.S. In 1935 she flew from Hawaii to California alone, and this was the very first time anyone had ever made a solo flight across the Pacific Ocean. Amelia set a speed record flying from Mexico City to New Jersey; and she also set many other speed, distance, and altitude records. She was given the Harmon Trophy, one of the nation’s highest aviation awards. In 1935 Amelia was invited to join the Purdue University aviation department as a visiting faculty member to counsel women on careers and help inspire others with her love for aviation. 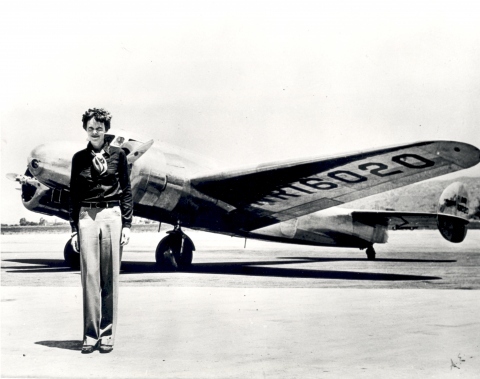 The next thing that Amelia Earhart planned was a flight around the world. She intended to circumnavigate the globe at the equator. Amelia started out from Miami, Florida, in June 1937 with navigator Fred Noonan. About a month later on the last leg of the flight, they were flying toward Howland Island in the central Pacific Ocean about 1,700 nautical miles southwest of Honolulu, when the plane mysteriously vanished. A massive sea and air search conducted by the U.S. Navy and Coast Guard was the most costly and intensive in American history up to that time. Still no trace of the plane or the crew was ever found. The disappearance of Earhart and Noonan has remained a mystery to this day. Two possible theories concerning the flyers' fate have prevailed among researchers and historians: that the plane crashed into the ocean and sank; or that they were castaway on some remote island. The unresolved circumstances of Amelia’s disappearance, along with her fame, attracted a great many myths, urban legends, and other claims relating to her last flight, all of which have been generally dismissed for lack of verifiable evidence. Seeking to chronicle Earhart’s fate 75 years after she disappeared over the Pacific, researchers set out on July 2, 2012, to look for wreckage of her airplane near where they believe the famed American aviator perished. Organizers hope the expedition will conclusively solve one of the most enduring mysteries of the 20th century – what happened to Earhart and Noonan. Amelia’s charismatic appeal, independence, persistence, courage, and goal-oriented career along with the circumstances of her disappearance at a rather young age have ensured her lasting fame in popular culture. Hundreds of articles and books have been written about her life, and her likeness has appeared in movies and other media. Countless posthumous tributes, memorials, awards and honors have been made in Amelia Earhart's name. She was a very brave woman pilot and a true aviation pioneer who won the respect of many people all over the world. http://tighar.org/Projects/Earhart/AEdescr.html - The Earhart Project is testing the hypothesis that Amelia Earhart and Fred Noonan landed, and eventually died, on Gardner Island, now Nikumaroro in the Republic of Kiribati. http://www.newsmax.com/SciTech/amelia-earhart-hunt-pacific/2012/07/02/id/444251 - Team to Hunt for Amelia Earhart's Plane off Remote Pacific Islet (July 2, 2012). http://www.ameliaearhart.com - The Official Website of Amelia Earhart is an informational site intended to honor the life, the legend, and the career of Amelia Earhart. http://www.biography.com/people/amelia-earhart-9283280 - Amelia Earhart’s life story. http://www.youtube.com/watch?v=hkbMpmV9Te8 - Amelia Earhart speaks on The Future of Women in Flying. 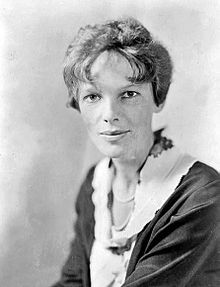 http://www.youtube.com/watch?v=lJg_-IwsmBE – Amelia Earhart interview footage following the 1932 transatlantic flight. http://www.ameliaflight.com//flight.po - Amelia Earhart's Flight Across America: Rediscovering a Legend. http://www.lib.purdue.edu/spcol/aearhart/ - George Palmer Putnam Collection of Amelia Earhart Papers. The world's largest collection of Earhart photographs, artifacts and correspondence.